LOS ANGELES >> A federal grand jury Thursday indicted a Rowland Heights woman, a former Hacienda Heights couple and two other defendants who are accused of running a $30 million pyramid scheme targeting Chinese communities on both coasts, authorities said Friday. Wen Chen “Wendy” Lee, 53, of Rowland Heights; Cheong Wha “Heywood” Chang, 47, of Taiwan and a former resident of Hacienda Heights; Chang’s wife Toni Chen, 46; Dalian “David” Guo, 53, of Hyde Park, New York; and Chih Hsuan “Kiki” Lin, 50, of Los Angeles and La Vegas are each charged with 13 counts of wire fraud and one count of conspiracy, U.S. Department of Justice spokesman Thom Mrozek said in a written statement. The five operated a Hong Kong-based company known as CKB, WIN169 Biz Solutions Ltd., CKB168 Ltd. and Cyber Kid Best Education Limited, officials said. The company purported to run a profitable business selling online educational courses for children, “but in reality was a pyramid scheme designed to generate new revenue by adding new investors,” Mrozek said. Prosecutors allege the defendants collected about $30 million from investors, primarily in Chinese-American communities in Los Angeles, San Francisco and New York City between 2011 and 2014. They kept about $6.5 million of the money for themselves and transferred the rest to others involved in the scheme, according to the indictment. “We believe that over 1,000 people invested in CKB, though it is unclear how many of those people invested directly through the defendants charged in this case,” Assistant U.S. Attorney Stephen Goorvich said. To lure investors into the scam, the defendants made numerous false promises and statements about CKB, which was not registered with the U.S. Securities and Exchange Commission, authorities said. All five defendants are expected to appear in court to enter pleas next month, Mrozek said. They were arrested earlier this month following the filing of a sealed criminal complaint, Mrozek said. Lin, who is also accused in the indictment of threatening victims in order to collect funds and dissuade them from talking to authorities, is being held without bond, while the others have been freed on bonds ranging from $250,000 to $500,000. If convicted as charged, each defendant faces up to 265 years in federal prison. LOS ANGELES >> Federal officials on Wednesday arrested the owner and two manager of a chain of four schools, including one in Alhambra, on charges of running a “pay-to-stay” scheme officials allege helped hundreds of foreign nationals remain in the U.S. as foreign students without attending classes. A federal grand jury returned a 21-count indictment against the three defendants Tuesday, U.S. Department of Justice spokesoman Thom Mrozek said in a written statement. The involved schools are the Likie Fashion and Technology College in Alhambra, Prodee University/Neo American Language School in Los Angeles; Walter Jay M.D. Institute, and Educational Center in Los Angeles; and the American College of Forensic Studies in Los Angeles. The schools were authorized by U.S. Homeland Security Investigations to sue Certificate of Eligibility for Nonimmigrant (F-1) Student Status for academic and languages students, Mrozek said. The school-issued forms, known as form I-20, made students eligible to obtain F-1 student visas allowing them to remain in the United States. The schools’ enrollees paid up to $1,800 “tuition” for six months of enrollment, Mrozek said. The schools collected as much as $6 million per year in purported tuition payments. But HSI officials who made an unannounced visit to Prodee University’s main campus in 2011 investigators to Prodee University’s main campus found only three students attending a single English class, although records indicated more than 900 students were enrolled at the university’s two campuses, Mrozek said. Another inspection the same day as the American College of Forensic Studies turned up a single student sitting in one religion class, officials said. Federal records reflected that the school should have had more than 300 active students. His investigators also found dozens of purported foreign students, primarily from South Korea and China, who originally entered the U.S. to attend other schools, but transferred to the Prodee Network, Mrozek said. “These students lived across the nation, indicating that they were not actually attending classes at Prodee or the other schools,” he said. School network owner Hee Sun Shim, 51, of Beverly Hills, who is also known as Leonard Shim and Leo Shim, is charged in the indictment along with alleged co-conspirators Hyung Cham Moon, 39, of Los Angeles, also known as Steve Moon, and Eun Young Choi, 35, of Los Angeles, also known as Jamie Choi, according to the DOJ. All three are charged with conspiring to commit immigration fraud, Mrozek said. Shim is also charged with 13 counts of use or possession of an immigration document procured by fraud, three counts of encouraging illegal residence and two counts of money laundering. Moon and Choi are each accused of one count of use or possession of an immigration document procured by fraud. HSI officials planned to immediately seek withdrawal of the schools’ Student and Exchange Visitor Program certification, Mrozek added. Any students enrolled at the involved schools were advised to contact SEVP representatives at 703-603-3400 for further instructions, officials said. Information is also available online at the SEVP page of ICE’s website at www.ice.gov/sevis/whats-new. IRWINDALE >> Police jailed a wanted felon Friday after he tried to using a stolen credit card and identification to buy items at an Irwindale hardware store, officials said. Daniel Garcia, 33, of Los Angeles, is accused of identity theft, false impersonation of another person and possession of drug paraphernalia, Irwindale police Sgt. George Zendejas said. He’s additionally wanted by South Gate police due to an auto theft warrant and Manhattan Beach police in an identity theft case. The arrest took place about 5:20 p.m. when the suspect tried to make purchases at Grainger Industrial Supply, 12780 Schabarum Ave., the sergeant said. Store employees called police to report the fraud attempt, and Garcia ran from officers when they arrived at the store, Zendejas said. He was captured nearby, without a struggle. Friday’s incident was the second time in recent days Garcia has gone shopping at the hardware store with stolen identification and credit cards, police said. He successfully bought goods at the store with fraudulent information in recent days, though the exact date was not available Saturday. 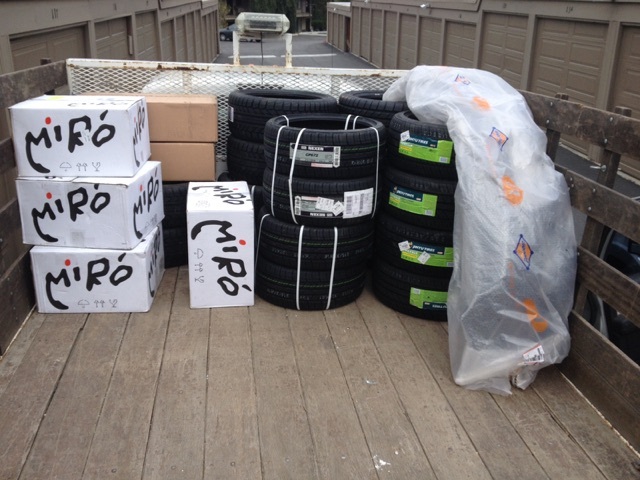 It is estimated that the suspect fraudulently purchased items totaling $3,000,” Zendejas added. According to Los Angeles County booking records, Garcia was being held without bail pending a scheduled arraignment Tuesday in West Covina Superior Court. 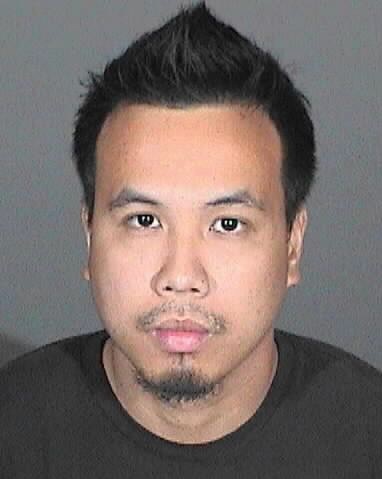 GLENDORA >> A West Covina man who has worked as a nursing assistant at healthcare facilities throughout the San Gabriel Valley is accused of stealing more than $40,000 from at least two elderly patients in Glendora by fraudulently using their financial information, police said. Police arrested 29-year-old Maui Berganio at his home Thursday, Glendora police Detective Zach Houser said in a written statement. He allegedly stole debit card and account information from two elderly guests of Kindred Transitional Care in Glendora to purchase items for himself online, including furniture, Nike tennis shoes and car parts, Glendora police spokeswoman Tricia Ayers said. “He’s worked at several different care facilities,” Ayers said. Detectives continued seeking any additional victims. “There could be possible additional charges filed,” she said. In addition to Kindred Transitional Care, over the past 10 years, Berganio has also worked at Arbor Glen Care Center in Glendora, Doctors Hospital in West Covina, West Haven Healthcare Center in West Covina, Citrus Valley Health Partners – Queen of the Valley Camapus in West Covina and Sierra View Care Center in Baldwin Park, police said. And it’s possible he has worked at other Southern California facilities. Berganio’s alleged identity theft first came to light Jan. 8 when a woman in her 80s staying at the care center noticed some suspicious behavior, officials said. 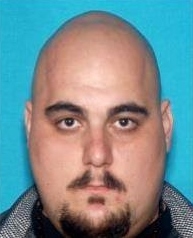 Investigators ultimately arrested Berganio Thursday afternoon at his home in the 1300 block of East Fairgrove Avenue in West Covina, according to police and Los Angeles County booking records. The suspect admitted also using the financial information of another woman in her 80s who was staying at Kindred Transitional Care over the past year, police said. The alleged victim died earlier this month. In that case, Berganio is accused of running up more than $40,000 in online purchases, Ayers said. Police booked Berganio on suspicion of elder abuse and identity theft, she added. According county booking records, Berganio was being held in lieu of $50,000 bal. He is scheduled to appear Monday in West Covina Superior Court. Anyone with information was asked to contact Detective Houser at 626-914-8286. PHOTOS of suspect Maui Berganio, 29, of West Covina, and photos of goods allegedly purchased with the stolen identities of elderly women, courtesy of the Glendora Police Department. LOS ANGELES >> The owner of a Glendora egg donation and surrogacy company pleaded guilty Thursday to wire fraud for misappropriating clients money for her own personal gain, officials said. Allison Layton, a 38-year-old former Glendora resident now living in Utah, entered the guilty plea in federal court in Los Angeles, U.S. Department of Justice spokesman Thom Mrozek said in a written statement. She also sometimes uses the name Allison Jarvie. Would-be parents paid tens of thousands of dollars to Layton for the services of Miracles Egg Donation between AUgust of 2008 and January of 2012, Mrozek said. But instead of setting the money aside for costs related to the services, Layton spent the money herself and used it to cover unpaid costs of other clients. As a result, Egg donors, surrogates, attorneys and others were not paid for all of the services they provided, Mrozek said. “More than 40 victims lost more than $270,000,” he said. Layton faces up to 20 years in federal prison when she returns to court for sentencing May 28. 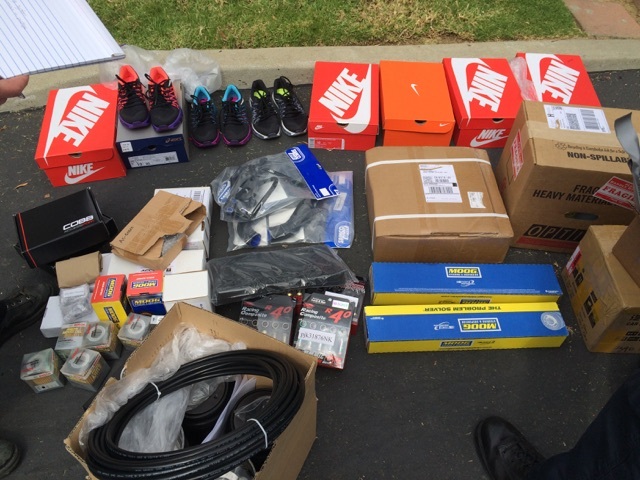 WHITTIER >> Police arrested four people and seized drugs, guns and hundreds of stolen or fraudulent credit cards and other identity theft-related gear during an early-morning raid Thursday at a Whittier home, officials said. The 5 a.m. raid in the 7200 block of Lynalan Avenue was the result of a months-long investigation by the Whittier Police Department’s Special Enforcement Team, Whittier police Officer Bradley White said. A SWAT team helped with the raid, White said. 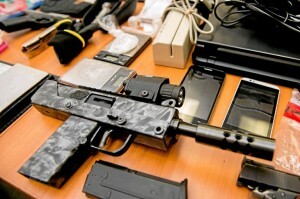 Officials used flash-bang grenades and tear gas as they forced there way into the home. 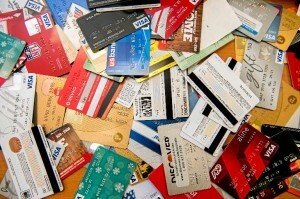 Inside the home, “There were hundreds of credit cards not in the names of the suspects,” White said. 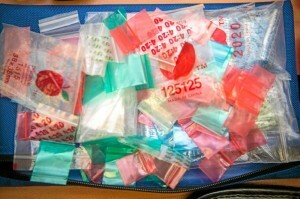 Police also recovered suspected stolen checks and IDs, as well as machines used to make credit cards. 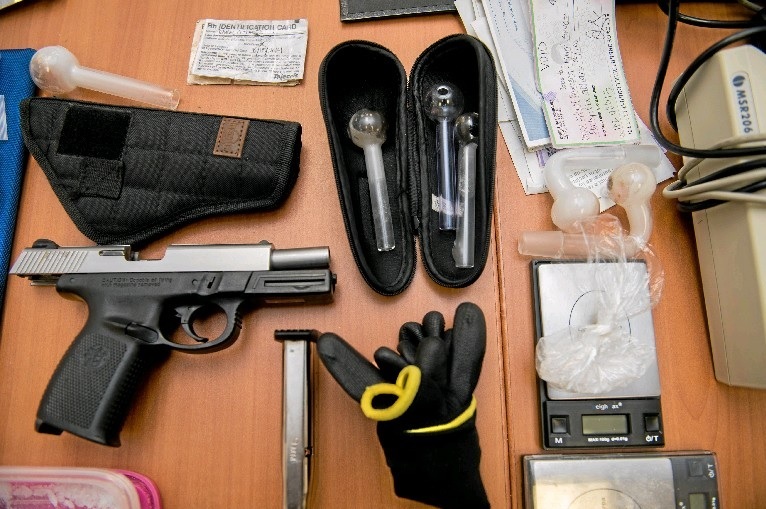 Additionally, police seized three handguns and nearly an ounce of methamphetamine with an estimated street value of about $1,000, police said. Police arrested two men and two women who were at the home. Resident Steven Perez, 32, of Whittier is accused of forgery, fraud, drug possession and weapons charges, White said. Raquel Monique Olivarez, 26, and Christina Marie Arroyo, 27, both residents of the home, were arrested on suspicion of forgery and fraud, according to Whittier police and Los Angeles County booking records. Another resident of the home, 37-year-old Joey Lojero, was cited for alleged narcotics possession, White said. And Bryan Sanchez, 19, of El Monte was jailed due to outstanding warrants. According to booking records, Perez was being held in lieu of $50,000 bail pending his initial court appearance. Olivares’ bail was set at $60,000, and Arroyo was being held in lieu of $70,000 bail. Sanchez was being held without bail. Though detectives had not yet determined exactly how the suspects obtained the allegedly stolen identifying information, White said often times, such information is taken during home and car burglaries. Police reminded the public to avoid storing valuables, including personal information, in an unattended cars, and to make sure homes are locked and secured before leaving. The investigation was ongoing, and additional arrested were possible, White said. Federal authorities arrested an El Monte woman and Pico Rivera woman Thursday on suspicion of filing fraudulent green card applications on behalf of immigrants, bilking some of them out of their life savings, officials said. Claudia Arreola, 35, of El Monte, who own Los Angeles-based California Immigration Services, and her employee, 35-year-old Leticia Gutierrez of Pico Rivera, were taken into custody by agents from U.S. Immigration and Customs Enforcement’s Homeland Security Investigations division, U.S. Department of Justice spokesman Thom Mrozek said in a written statement. A federal grand jury Tuesday indicted the women on six fraud-related counts, officials said. Six victims are named in the indictment, however investigators suspect there are likely dozens more. The defendants charged undocumented immigrants who were married to U.S. citizens as much as $24,000, claiming to be able to help them secure legal immigration status, Mrozek said. But they went on to submit fraudulent documents, such as fraudulent I-94 cards stating the clients, who came to the U.S. illegally, were in the country legally on visitors’ visas. “Subsequently, investigators say when several of the foreign nationals sought refunds after they failed to receive ‘green cards,’ the defendants allegedly threatened to contact authorities and have the aliens deported,” according to Mrozek. The similarity between the acronym for Arreola’s business, CIS, and that of the U.S. Citizenship and Immigration Services, USCIS, “was no coincidence,” Mrozek added. Investigators found that money orders and cashiers checks issued to USCIS had been deposited into a bank account controlled by Arreola and Gutierrez. The two defendants, among others, previously came under federal scrutiny in 2003 when they were sued by the government for allegedly providing immigration services in violation of California law, officials said. Under a settlement, they agreed not to engage in any illegal immigration consulting services. They opened California Immigration Services in 2006. If convicted as charged, Arreola and Gutierrez could each face up to 60 years in federal prison. They were scheduled to be arraigned Monday in federal court in Los Angeles. Police arrested two Glendale men, including one already under investigation by the U.S. Secret Service, after they were caught installing a skimming device on a gas pump at a Sierra Madre gas station early Saturday, authorities said. 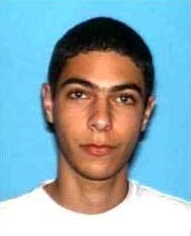 Edvard Martirosyan, 27, and Aram Manasaryan, 22, were arrested shortly before 3 a.m. outside the Valero gas station, 4 N. Baldwin Ave., Sierra Madre police officials said in a written statement. They’re accused of several felony charges for allegedly trying to install the device in order to capture credit card numbers of unsuspecting customers. The U.S. Secret Service, which has already filed a separate case against Martirosyan, is spearheading the investigation into the two suspects, officials said. The arrests came after police officers were responded to an alarm at the gas station. In the suspects’ car, police found other skimming devices, laptop computers, counterfeit credit cards and other tools used to break into gas pumps, officials said. Martirosyan was out of custody on bond in his pre-existing federal case when he was arrested along with Manasaryan Saturday, officials said. He was arrested in August in connection with an alleged identity theft ring operating skimmers at gas stations in and around the San Fernando Valley. The incident was the second time in recent weeks police have investigated possible tampering at the gas station. Police cautioned the public to be wary late last month after learning someone had tried to break in to the gas pumps at the Valero station May 23, police said. But station owner Edgar Artenyan said an expert had examined the pumps and determined no customer information had been compromised in the crime, which was thwarted by an alarm. It was unclear if Martirosyan and Manasaryan were also suspected in the May incident. Officials again asked customers of the station who purchased gas at the pumps using a credit or debit card between May 22 and June 6 to watch their financial accounts for suspicious activity, “just to be on the safe side,” according to the police statement. According to county booking records, Martirosyan and Manasaryan were being held in lieu of $500,000 bail each at the Pasadena Police Department’s jail pending their initial court appearances. PHOTOS of Edvard Martirosyan (top) and Aram Manasaryan (below) courtesy of the Sierra Madre Police Department. SIERRA MADRE — Police warned those who filled up at a Sierra Madre gas station Friday to watch their bank accounts for suspicious financial activity after discovering someone had tampered with the gas pumps.